Prepare pesto by placing spinach, dried and fresh oregano, garlic, olive oil, vinegar and black pepper in a food processor; pulse gently until coarsely minced. Remove from food processor to a bowl and stir in the Feta cheese and red bell pepper; set aside. Preheat broiler oven to 450 degrees F.
In a small bowl, mix the panko, cornmeal, oregano, garlic powder, lemon pepper and butter to make a paste. Heat a large, heavy skillet over medium-high heat. Rinse any ice glaze from frozen Alaska Cod under cold water; pat dry with paper towel. Brush both sides of fillets generously with olive oil. Place cod in heated skillet and cook, uncovered, until lightly browned, moving fillets gently and adding small amounts of oil as needed to keep fillets from sticking. Without turning fillets over, cook 3/4 of the way through, about 5 to 6 minutes for frozen cod or 3 to 4 minutes for fresh/thawed fish. Remove fillets from skillet and place in a large baking pan, browned-side down. Pat fillet tops dry with paper towel. Brush generously with lemon juice, then spread with panko/butter mixture. Place fillets in broiler and cook until the coating is crispy, about 2 to 4 minutes. Cook just until fish is opaque throughout. 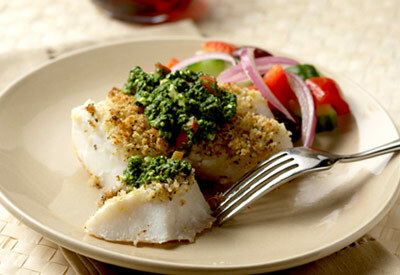 To serve, top with a generous dollop of pesto and garnish with fresh oregano. Depending on the saltiness of your Feta, you may need to add additional salt to the pesto.